Wilwood Engineering Brake Caliper UNIVERSAL - Brakeswap.com - Friction for the Win! Wilwood’s GN lll is a time proven caliper that has been widely used with 5 on 5 hubs for stock car, road course, and off-road competition. The 3.50” mount configuration (also available in 6.00” mount) incorporates this legacy of enduring performance, with options available for the latest brake system heat management technology. The W6A forged six piston caliper delivers heavy duty stopping power for the road or track. The caliper incorporates race technology into a body design with widespread adaptability. Radial mounting, two options for piston volume, and a redisigned rotor diameter range from 12.19” to 15.00” give this caliper the versatility necessary to suit all types of heavy weight braking requirements. The W4A forged four piston caliper delivers heavy duty stopping power for the road or track. The caliper incorporates race technology into a body design with widespread adaptability. Radial mounting, four options for piston volume, and a newly increased rotor diameter ranging from 12.19” to 15.00” give this caliper the versatility necessary to suit all types of heavy weight braking requirements. The billet SL6R series adds the versatility and convenience of radial mounting to this widely popular caliper group. Radial mounting simplifies adaptation and provides two planes of adjustment for accurate alignment over the disc. These calipers integrate “Big Brake” style with Wilwood’s latest technology to generate big stopping power in extreme environments over a broad range of vehicle applications. The billet SL6 series integrates “Big Brake” style and Wilwood’s latest technology into the traditional 3.50” centered lug mount Superlite caliper category. Each caliper is precision CNC machined from high strength billet into three specialized configurations that cover a broad range of competition and sports driving applications. This specially configured Superlite SL4R narrow body caliper features an increased bridge radius to allow proper pad alignment and bridge clearance for use with 13.00” to 14.00” diameter rotors. A special body design is used with 16mm pads to provide the narrowest possible profile for tight clearance applications. Radial mounting simplifies adaptation and provides two planes of adjustment for accurate alignment over the disc. The billet SL4 caliper incorporates Wilwood’s latest technology in a conventional 3.50” centered lug mount design, with weights starting at 4.94 pounds. This caliper series has been structurally designed for high clamping efficiency and low deflection in a body width compatible with all wide 5 and 5 × 5 style hubs. It is a direct replacement for all other Superlite style calipers. The Forged Narrow Superlite 6R (FNSL6R) is our newest version for the venerable Superlite caliper series adds the versatility and convenience of radial mounting to this widely popular caliper group. Radial mounting simplifies adaptation and provides two planes of adjustment for accurate alignment over the disc. These calipers integrate “Big Brake” style with Wilwood’s latest technology to generate big stopping power in extreme environments over a broad range of vehicle applications. The Forged Narrow Superlite 4R (FNSL4R) is our newest version for the venerable Superlite caliper series adds the versatility and convenience of radial mounting to this widely popular caliper group. Radial mounting simplifies adaptation and provides two planes of adjustment for accurate alignment over the disc. These calipers integrate “Big Brake” style with Wilwood’s latest technology to generate big stopping power in extreme environments over a broad range of vehicle applications. D8-6 calipers are a direct bolt-on replacement for the OE calipers on all 1965-82 Corvettes. Forged billet aluminum bodies, stainless steel pistons, and high-temperature seals put an end to the rust, bore pitting and seal failures that plague the OE caliper design. D8-6 calipers provide low-maintenance performance, a huge weight savings, high temperature reliability, and the added benefit of six piston pad clamping power. D8-6 calipers mount in the stock location over stock rotors, use the original style D8 brake pads, and fit snugly inside most ’67 or newer production wheels. Some wheels, including the 1965-66 OE “JK” code steel wheels and a few aftermarket replica alloy wheels, will require a 3/16” or wider wheel spacer for clearance. D8-4 calipers are a direct bolt-on replacement for the OE calipers on all 1965-82 Corvettes. Forged billet aluminum bodies, stainless steel pistons and high-temperature seals put an end to the rust, bore pitting and seal failures that plague the OE caliper design. D8-4 calipers provide low-maintenance performance, a huge weight savings, and high temperature reliability for street or track. D8-4 calipers mount in the stock location over stock rotors, use the original style D8 brake pads, and fit snugly inside most ’67 or newer production wheels. Some wheels, including the 1965-66 OE “JK” code steel wheels and a few aftermarket replica alloy wheels, will require a 3/16” or wider wheel spacer for clearance. Wilwood’s new DynaPro Honda/Acura Caliper (DPHA) for Honda and Acura models originally equipped with 262mm diameter rotors. These calipers bolt directly to the stock mounts on factory spindles, fit over the OE 262mm diameter rotor and accept the OE brake hose with a 10mm x 1.5 banjo bolt. Designed around Wilwood’s proven DynaPro series four piston calipers, the forged billet bodied DPHA caliper delivers high-strength clamping force and positive stopping power. Four stainless steel pistons provide fully balanced pad loading, along with the corrosion resistance and thermal retardant qualities of the stainless alloy that will keep your calipers cooler and running trouble free for many more miles. Calipers work perfectly with the most OE master cylinder sizes and ABS functions, and are available with either black or red high-gloss, high-temp, brake fluid resistant sealed powder coat and feature Wilwood’s signature logo. GNX4 calipers are the product of Wilwood’s in-house FEA design and 3-D modeling technology. With its unyielding strength and superior piston design, the GNX4 generates positive pedal response and high clamping efficiency with a substantial weight savings over comparable OE Calipers. Base model calipers feature a natural aluminum finish protected by a durable clear coat anodizing. Forged billet aluminum bodies, stainless steel pistons, and high-temperature seals put an end to the rust, bore pitting, and seal failures that plague many OE caliper design. Wilwood’s D154 forged billet caliper is a direct bolt-on,lightweight, high-strength, extreme duty alternative to the OE cast iron calipers that were used on a wide range of factory disc brake equipped mid size GM cars and small trucks beginning in 1978. Use of this caliper can still be found on some GM models as late as the year 2002. The wide spread and affordable availability of D154 calipers and brake pad compounds also made it a popular choice in a number of restricted class competition categories and drum to disc conversions on all types of hot rods and street machines. The DP6 marks a noteworthy step in the evolution of the DynaPro caliper series. DP6 calipers offer the performance advantages of a larger pad and a six piston differential bore configuration, with complete bolt-on interchange ability to the four piston 5.25” lug mount DynaPro models, and the long standing Dynalite caliper series. Narrow DynaPro four piston radial mount calipers combine pure race technology with a new generation of Wilwood performance enhancements. The Narrow DynaPro combines the versatility of radial mounting with a sleek profile, superior strength, and extreme durability. Wilwood’s Billet Narrow Mount Dynalite (NDL) caliper combines the lightweight, high torque performance of our Dynalite Series Calipers, but utilizes a thicker pad design and bolts directly onto standard Superlite 3.50” mounts. Caliper weights starting at 3.50 pounds, yet provides tremendous brake torque. The caliper is extremely compact and will easily mount in limited clearance applications. Its computer generated billet design incorporates internal fluid crossover passages to eliminate external tubes, while the extra thick 0.63” (16,0 mm) Dynalite pad is securely held in by the bridge bolt design. Standard Wilwood features include deep cup stainless steel pistons, high temperature piston seals and black anodized finish. The caliper is available in 1.75, 1.62, 1.38 and 1.12 inch piston bores for 1.25, .81, .50 and .38 inch rotor widths. The Billet NDL is ideal for many racing applications, including Late Models, Modifieds, Sprints, Off Road and Road Racers. Wilwood’s new Forged Narrow Mount Dynalite (FNDL) calipers are ideal for and widely used in many competition applications including late models,modifieds, sprints, off road and road racing. Computer generated design and stress analysis technology, is the latest innovation from Wilwood providing substantial improvements in strength and performance over all comparable caliper models. Narrow Mount DynaPro (NDP) forged billet calipers represent the next generation of calipers available as an upgrade or direct replacement for the popular Narrow Mount Dynalite model series with 3.50” mounting. NDP calipers combine superior strength with several new performance enhancements to make these the best “Dyna” series calipers ever built. The DynaPro Dust Boot (DP-DB) forged billet caliper represents the newest generation of calipers available as an upgrade or replacement for applications previously using the long-standing Dynalite model series. DP calipers combine pure race technology with several new exclusive Wilwood performance enhancements. DP-DB calipers incorporate a new aluminum piston and dust boot sealing system primarily for non-U.S. markets that may require external sealing of caliper pistons. 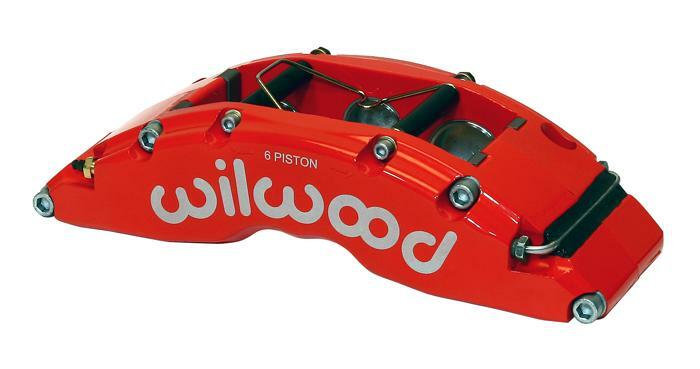 Wilwood’s Combination Parking Brake (CPB) Hydra-Mechanical Caliper uses hydraulic pressure for stopping and a mechanical locking mechanism for a parking brake. This redesigned unit provides new options for drum brake conversions and disc upgrades on rear axles that are not conducive to internal shoe systems. This caliper, when matched with the correctly proportionate rotor diameter, provides balanced bias and brake performance for use in conjunction with front wheel brake upgrades. The Billet Dynalite caliper is powerful, compact and super lightweight. Advanced computer engineering keeps this caliper extremely rigid, resulting in incredible brake torque at a bare minimum in weight, starting at 2.66 pounds. Internal fluid crossover eliminates external tubes and the four position, two-piece bleed screws allow for convenient mounting and easy bleeding. The Billet Dynalite uses standard quick change Dynalite pads, deep cup stainless steel pistons and high temperature seals, and has a black anodized finish. The time proven Dynalite caliper design is stronger and lighter than ever – ideal for Late Models, Modifieds, Sprints, Road Racers and Dragsters. The GP 320 billet four piston caliper is a compact, high efficiency performer. Weighing just 1.70 pounds, it was purpose built as an upgrade with increased pad size over two piston calipers on lightweight open wheeled racecars. The GP 320 is also well suited to other performance and racing applications including, but not limited to karts, motorcycles, mini-sprints, and formula sports racers. The GP 320 bridge configuration will accommodate rotors between .75” and .81” thick, with overall diameters between 9.00” and 11.50”. The DynaPro Single Lightweight( DPS-LW) billet caliper is the newest generation of calipers available as an upgrade or replacement for applications previously using the Dynalite Single (DLS) series. DPS calipers combine superior strength with performance enhancements to make these the best “Dyna” series calipers ever. Lightweight design insures sufficient clearance in tight situations like Sprint Car front ends. Wilwood’s Billet Dynalite Single utilizes close tolerance design and manufacturing techniques which results in the most rigid, lightweight and attractive caliper in the evolution of the Dynalite Single Series. Starting at 1.58 pounds, the Billet Dynalite Single is perfect for compact high performance braking as required in Open Wheel, Drag, Modified, Kart, Motorcycle and Off Road applications. Wilwood’s GP310 motorcycle disc brake caliper has been designed and engineered for use on 1984 – present Harley-Davidson® Motorcycles. Built around a 4-piston, high performance powerhouse, this billet aluminum caliper brings distinctive, bolt-on styling: Direct leg-mounted calipers are available for all single and dual disc models (except Springer and 4-speed FL models), as well as the 1983 XR 1000. Don’t hide your custom wheels! Show them off with the new Stealth brake system’s revolutionary design. These floating die cast aluminum calipers are strong, compact and an inexpensive answer to the braking needs of recreational, agricultural and industrial vehicles. Lightweight, starting from 1.1 pounds and fits rotors from .15” to .25” thick. Features include a single piston design available in either 1.06”, 1.19” or 1.25” bore size. Calipers include a fitted dust seal to prevent ingress of environmental contamination, dual bleed screws for versatility in mounting position and fluid inlets in M10 × 1.0 banjo. Wilwood’s single piston floating Mechanical Spot Caliper is compact,lightweight and widely used in Parking Brake, Karting, Sport Utility Vehicles and Light Industrial applications. Its two position, cam-actuated lever permits right or left, front or rear mounting, and accommodates two settings for leverage adjustment.The 1.2 pound Mechanical Spot fits rotors with diameters from 6.00” to 13.00”, thickness from .25” to .81”, and is supplied with pads installed. The caliper is available black or polished finishes.